Something I have learnt through experience is never ask a group a question that you do not know how to answer yourself. This is not about being omniscience but being prepared first to draw on one’s own experience before expecting others to do likewise. As we look beyond the Triduum to the Easter Season and see 6-7 weeks of mystagogy we need to remind ourselves the celebration of the Triduum is the starting point. Perhaps we need to first note down our experience of the liturgies of the three days. I am a great one for jotting down the practical details: what went well, what needs to be attended to next time, what could be better. This is all very useful when we come to prepare the following year’s liturgies. But here I am more thinking of a journal. Reflections and impressions over three days. Even if you are busy as a liturgical minister in some form your need to participate. Participation is the first condition of mystagogy. What were your expectations before hand? Was there a word or a phrase in the readings that stayed with you? Which symbols caught your attention? What words would you use to describe the liturgy? During the intercessions for whom did you pray? What did feel like to kiss the cross? What did you see as you gathered around the fire? How many times did images of water come in the readings? How would you depict the liturgy of baptism? These questions are only starters. After you have got down your impressions take the opportunity to come back to them, to reflect on them. Ask why did you think or feel that, what can learn about what we celebrate, about Christ. These reflections will enable us to help others to reflect. In the end though it will be the neophytes who lead us deeper into the mysteries. This paradox is at the heart of the Easter gospel. 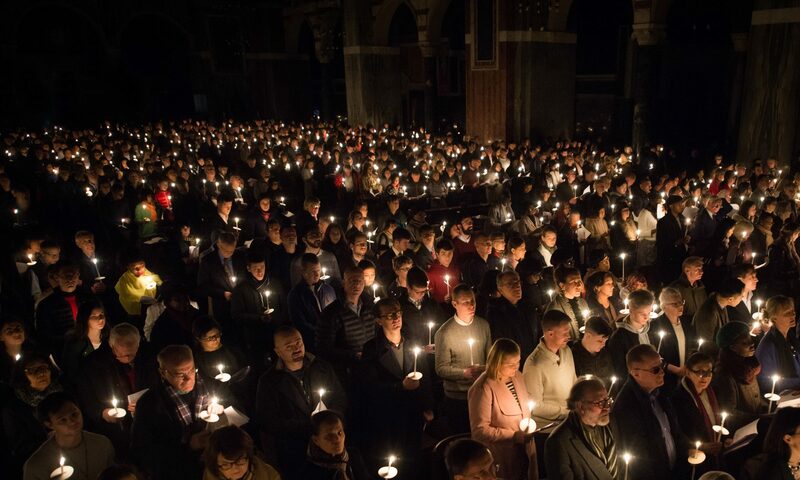 When I prepare the liturgy booklet the one thing I am likely to forget is the reading that changes each year — the gospel at the Easter Vigil. One of the element that is common to gospel in all three years is that the resurrection is announced by someone in white garments. In Matthew ‘His face was like lightning, his robe white as snow’. It is not too fanciful make a connection with those who will rise up from the waters and put on a white garment, white as snow perhaps. In the waters of baptism they will die and rise with Christ, they are the sign that Christ is risen in our midst. From them over the coming weeks we will learn what it all means. And if it is – how on earth did we get here? This last week of Lent might be a good time to offer them the opportunity to look back on how they got to this point. This week’s blog could be used as a guided reflection inspired by the Year A Gospels – as part of an RCIA session or individually over a coffee – or both! Brew up – settle back – and relive the journey to this last week of Lent… it really IS Holy Week next week – how on earth did we get here! It started somewhere… Jesus’ public ministry started with his baptism in the Jordan – spend a few moments building up the scene in your mind’s eye. Jesus emerging from a crowd … John’s reluctance … Jesus’ immersion in the river and the dove coming upon him… and the words from God: This is my beloved Son – listen to him. When have I felt that love of God for me – sensing that I am God’s beloved son – beloved daughter? Almost immediately, Jesus is sent into the wilderness – to be tempted – challenged? Where have my wildernesses been? … When have I faced challenges which have helped me to find God and God’s will for me? And Jesus took three close friends to the top of a mountain and became transfigured – their friend but not their friend… divinity shining from him – majestic divinity in the air all around them … and that voice again: My Son – the Beloved – listen to him. What words of Jesus have spoken most powerfully to me over the last few months? It hasn’t always been plain sailing – there have been times of weariness and uncertainty – when I’ve needed time and the faith of others to recharge my batteries. When have I come to the “well” – come to listen to Jesus and to other people – and found myself refreshed? When have people come to the “well” – and I have found myself like the Samaritan Woman – engaging in conversation and listening and helping myself and my companions to go deeper into the mystery of God? When have I taken my experience of encountering Jesus back to others? And the Gospel of last week – the story of the person born blind … whose soul saw things hidden from the sight of others … who stuck to his story no matter what pressure he was put under …. When have I had a sudden insight – a kind of dawning understanding of something that had been hidden from me before? Have there been things during my RCIA sessions that have been like a bolt from the blue – or shaft of lightning? When have others not seen the truth as I have… and how did I feel? And what of Martha or Mary in the Gospel story of the raising of Lazarus? When have I been like Martha – heading down the road to meet Jesus … and telling him like it is: If you had been here this wouldn’t have happened. Where were you when ……..(name something that stretched your faith)? Or, when like Mary – overcome with sorrow and just unable to make the first move – but sensing the Lord somewhere out there … And how do I feel when I recall the shortest verse in Scripture: Jesus wept. Jesus’ own grief coming through … his own tears shed with those of Martha and Mary… his own tears shed with my own – his tears for my sorrow … His compassion which does not deny sadness but shares it – and seeks to transform it. When have I sensed the healing love of my Lord? It really IS Holy Week next week! How did I get here? And more importantly – where is the Lord leading me from here – from the waters of Baptism to….? from anointing and gifting with the Spirit to …? to the Lord’s Table … and from there…? If you ever find yourself in Oxford make your way to the chapel of New College. There you will find a truly remarkable statue of Lazarus by Jacob Epstein. It is in white marble. As you look you will see the bands of death being stretched round the body of Lazarus almost to breaking point. He is being dragged reluctantly from the grave. This reluctance to come forth from the place of safety and death is further emphasised by the fact that his head is turned backwards as he is being pulled back to life. That beautiful piece of sculpture offers a profound insight into the story of Lazarus found in John’s Gospel:- Resistance to true freedom. To get inside the story we need to identify our own resistance to removing the stone covering the cave where the body lay buried along with our resistance to believing the word of Jesus that endlessly gives life. Having taken the stone away listen to the word spoken in a loud voice “Lazarus come out”. A loud voice reaching down into the very depths of all that is life taking: That echoes through the ages and that cannot be resisted. The command “Unbind him and let him go” reflect the word spoken to Moses from the Burning Bush:- “I will send you to Pharaoh that you may bring the sons of Israel out of Egypt” – the house of slavery. What am I reluctant to reveal about myself or my community? What in my life am I reluctant to change? What do I or we want to keep hidden away? What do I or we need to do to set others free? What word or command of Jesus do I most resist? What word or command of Jesus echoes deep within me? From what do I or my community need to be unbound and set free? The prayer prayed over the Elect and on behalf of the community has much to offer to these reflections. The prayer is geared towards those who are preparing for baptism at the Easter Vigil but can easily be adapted for those already one with us through baptism or for the community as a whole. The lines or words in italics are offered as a possible adaptation. and to lead us to the resurrection. for he lives and reigns for ever and ever. Amen. and have it more abundantly. and deliver them from the spirit of corruption. “Sickness struggles to own the world. I want you to live. Live, do you hear me? Half-living is a safe hell. Yesterday in our parish Sunday Mass many will have experienced the first scrutiny – and allowed that gospel encounter of the woman with Jesus at the well to interpret our own lives and inner longings. As we walk with Christ, our way, our truth, our life, along the lenten pathway towards Easter, we too meet the people he meets – through wilderness, up and down mountains, thirsty woman, blind man, dead man, welcoming crowd, angry mob – we too enter into that sense of being ‘handed over’, and having to trust God that this is the right path. And the scrutinies are moments of self-searching, repentance, enlightenment. They are described in RCIA 141 as having a spiritual purpose – to uncover and heal all that is weak, and to bring out and strengthen all that is good and strong. Their aim is to ‘complete’ conversion and deepen our resolve to hold on to Christ. Their focus is towards salvation and the resulting new life and freedom that brings. As individuals and community, in reflecting on the experience of the scrutinies, may we become more and more consciously aware of being filled with Christ – living water, light of the world, resurrection and life. We are not diminished by the experience.. we are set free. So, what was the experience like for you? In what ways are you ‘thirsty’? What does the encounter tell you about Christ? Originally there was going to be a week’s break on Walking the Rite waybut when I was preparing the next 3 Year of St Paul leafletsI was struck by how in the middle of Christmas — at the Dawn Mass — there is baptism. Here is the passage and the prayer from the leaflet (adapted from RCIA) for reflection. When the goodness and loving-kindness of God our Saviour appeared, he saved us, not because of any works of righteousness that we had done, but according to his mercy, through the water of rebirth and renewal by the Holy Spirit. This Spirit he poured out on us richly through Jesus Christ our Saviour, so that, having been justified by his grace, we might become heirs according to the hope of eternal life. All-powerful God, Father of our Lord Jesus Christ, by water and the Holy Spirit you freed your sons and daughters from sin and gave them new life. Send your Holy Spirit upon us to be our helper and guide. Give us the spirit of wisdom and understanding, the spirit of right judgment and courage, the spirit of knowledge and reverence. Fill us with the spirit of wonder and awe in your presence. In the Gospel of the Fourth Sunday of Advent, we hear that Joseph had learned the news of Mary’s pregnancy. What would have been going through his mind as he tried to work out what to do? The desire to keep his honour wrestling with his desire to protect this young woman from any more disgrace than she was already facing…How many nights had he tossed and turned – before a fateful night on which, it could be said, the history of salvation depended. The Word had become Flesh but was infinitely vulnerable – and would be for many years. How was the Child to be protected in the long years of childhood if this good man rejected the woman who he thought had so seriously betrayed him? And God sends a messenger to speak to this man in a dream… to enter his troubled sleep with words of comfort – of reassurance.But words that made no sense -what on earth does a child having been conceived by the Holy Spirit mean? Joseph – like his namesake hundreds of years before – was a dreamer. Like the earlier Joseph, he trusted the dreams – and would have known that dreams are not always sweet – and their interpretation not always comfortable.Hadn’t the first Joseph ended up in Egypt because of his dreams? But then, hadn’t he ended up as Pharaoh’s right-hand man because of his skill in dream interpretation? And don’t we now know that this Joseph’s dreams were not prophesying a quiet life? Yet he took Mary into his home and brought up the Child with such love that when Jesus came to try to express something of what God was like, he used the childhood word he would have used for Joseph: Abba. What was in that dream that led a Jewish carpenter to stake the rest of his life on it? An angel told him not to be afraid – that all these strange circumstances fall within God’s plan – within God’s great Dream for humanity. For a short time the dreamer catches a privileged glimpse into the Dream and for the rest of his life will play his part in its unfolding. Those we accompany of their journey come with their own dreams – those glimpses that draw them to God – to enquire ‘what does this mean?’ – to question ‘is it real?’ Perhaps our role as catechists is to act as angels – as messengers of God. We listen to their stories – to their dreams – and we say “don’t be afraid. God is with you.” And we share from our experience of living out our part in the Dream. We speak of other players in the Dream – the great and the small – the ones who sought to interpret and the ones who simply gazed in rapt awe upon the mysteries within it. We tell of those who also staked their lives on the Dream – who gave and give their lives for love of it. We lead them into rites which earth the Dream in sight and sound and touch and taste and smell – for it is the Dream of the Word Incarnate – en-fleshed – a Dream to be lived out in human bodies. We feed the mind – the imagination – for it is here that the Dream takes root and heart. Like Joseph, we are keepers of the Dream – but not its owners. We have heard our own angels calming our fears and encouraging us to faith – to hope and to love. Joseph’s charge was the protection of the Child Jesus and his mother – ours to retell their stories. His privilege, it is said, to die with Jesus and Mary at his side – ours to know that his adopted son broke the barriers of death and made real the yearning dream of eternal life. His faith was to face the shattered dream of conventional marriage and family life and to trust the greater Dream through long journeys and exile. Ours is to stand with others in their broken dreams and to brave the journeys and the exiles that form our part of the Dream. For we have glimpsed the Dream. We have sensed that before we were formed in the wombs of our mothers, God was dreaming of us and of the part we would play in the unfolding of his Great Dream. Our parts may be small – but are no less important for that – for without them the Dream is incomplete.In witnessing our faith, others learn to trust the dream planted in them and to let God’s Dream take root – and grow closer to its fulfilment through those who, like Joseph, dare to dream their dreams and to stake their lives on the truth of the greater and eternal Dream. What’s in a Family Tree? Monday the 17th December marks a change in the journey towards Christmas or perhaps more correctly it marks a moment when the birth of Jesus comes to meet and remind us that we are all part of his family tree. Matthew’s Gospel begins with the family tree of Jesus the Christ, son of David, son of Abraham. It is beautifully put together, neatly divided and very often missed out as the list of names has a tendency to confuse rather than inform. Yet it is worth looking at and reflecting on. Genealogies tell us where and who we come from, they give us a sense of identity and point us in a direction. Really good genealogies include even the skeletons we would like to keep in the cupboards of our lives. A bit like Harry Potter hidden away under the stairs. The genealogy of Jesus goes a long way to telling us who he is, where he comes from and where he’s going. He is a carries in his genes the blood of Abraham and the blood of David. It is important to remember that when Abraham began his journey from the ancient city of Ur, near modern Basra, he was a gentile. As King Hussein of Jordan reminded us when he spoke at the funeral of his friend Yitzhak Rabin’s funeral “we are all the children of Abraham”. If only we could take on board the implications of that word. The radicalness of us all being children of Abraham is found in the words of John the Baptist when he says “God can raise up children of Abraham from these stones”. See the world through inclusive rather than exclusive eyes. Jesus also carries the blood of David, the great King,who reigned over the Israel at a time when they were at their most powerful, a kingdom that stretched from Dan to Beersheba. A Kingdom which didn’t last long, became divided and eventually became totally destroyed resulting in the deportation of the people to Babylon. The exile in Babylon makes a key moment in the history of Jesus’ people. When all is lost and there appears to be no future, how can we and even God stay faithful to us? A truly terrible time. Akin in the gospel story to the disciples facing the crucifixion of Jesus. All is lost, there is no future. How can we go on? Should we give up? The Exile and the Crucifixion of Jesus amazingly become the great moments of Hope rather than despair. A miracle indeed! The family tree of Jesus tells us that he carries the whole story of his people and not just his people in a narrow way but the story of all of us. The skeletons in the cupboard come in the names of the women mentioned in the otherwise more normal list of men. They are to say the least foreign and to a greater or lesser extent involved in rather dubious behavior even though they are undoubtedly very strong women who despite the unquestioned difficulties which face them come out with great integrity and wholeness. Tamar: Who uses all of her cunning and skill to get her rights: Genesis 38 Rahab:of the scarlet cord hanging from the window: Joshua 2 Ruth:The Moabitess who becomes the Great Grandmother of King David: Book of Ruth Uriah’s wife:The unnamed Bathsheba who is simply taken by David and whose husband, the honourable Uriah the Hittite is murdered on David’s orders. 2 Samuel 11 And finallyMarywho is found to be with child by the Holy Spirit and whom Joseph takes home as his wife and who is named Jesus but will be called “Emmanuel” a name which means ‘God is with us’. The family tree of Jesus is definitely worth more than a glance or two. Also of course our own family tree whether that tree be biological or of our faith journey carries much that can enlighten, enrich and even challenge our lives. It is always good to remember that we are all in one way or another members of the family tree of Jesus.